Wow - talk about a bang for your hard earned bucks! This home is priced almost $30,000 BELOW its tax assessment. 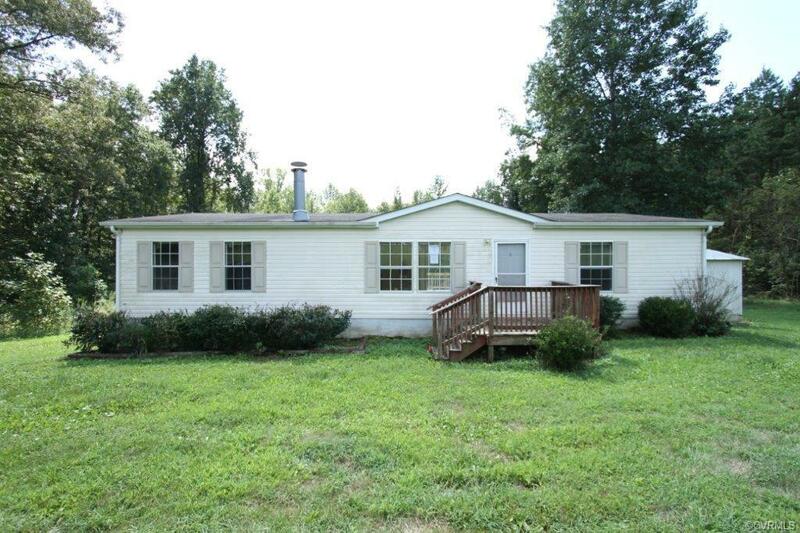 This 3 bedroom, 2 bath home sits on 4 acres in Goochland County, and is only about 7 miles off the Gum Springs exit in the Sandy Hook Area, which gives you a wonderful opportunity to enjoy country living, while not being too far from the city. One of the first things you'll notice is that the home gets lots of natural lighting. The living room is large, which boasts a ceiling fan and fireplace, and so is the kitchen, which offers a dining area. The huge back deck can be accessed from the kitchen and will surely be a place the whole family can enjoy from sunrise to sunset. The master bedroom has a huge master bathroom, which features a garden tub (perfect when you just want to relax and unwind!) and a separate shower. The other two bedrooms are on the opposite side of the home which should give everyone their privacy. The home is not perfect, but the price gives you an opportunity to add your own personal and unique touches to the home and showcase its beauty and potential. HUD homes are sold as-is with no guarantee or warranty by the Seller or Listing Broker.